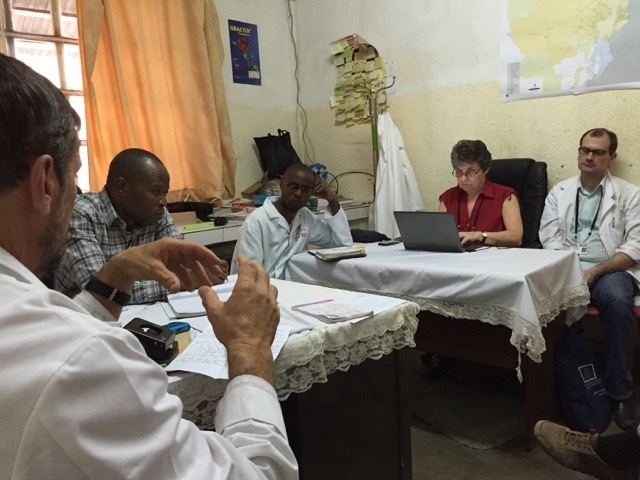 This week the remaining AusHEAL team at HEAL Africa Hospital [HAH] in Goma have seen some high points and sadly some low points of life in D.R.Congo. The week commenced when a 2½ year old girl was brought to the hospital after a violent sexual assault by an older man in uniform! This is just one of the reasons why D.R.Congo is often called the ‘heart of darkness’. We became involved due to her blood loss and the concern that she had an intra-abdominal or pelvic injury as well. The details are too distressing to mention. The HEAL Africa team handled this case so well with both consultant gynaecologists involved as well as their sexual violence unit. Sadly they have so much experience in this area. The girl is recovering physically but who knows what psychological damage has been done. This is the third similar childhood case in the past 2-3 months! 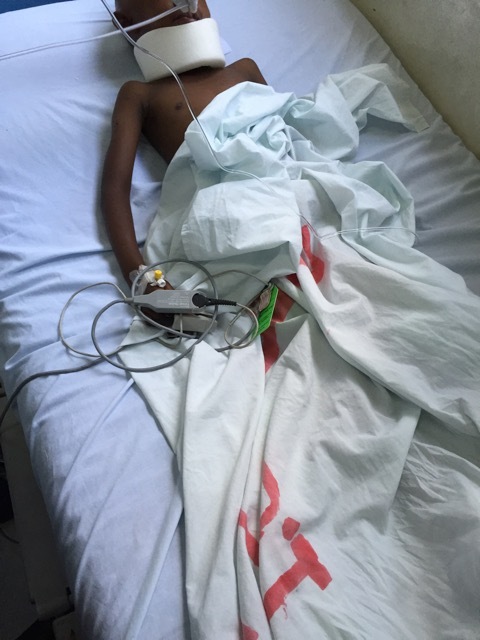 On Friday a 5 year old boy was admitted with a severe head injury after being hit by a moto outside his school. With no CT scan and few resources he sadly died soon after admission. His parents had no money so the original hospital he was taken to sent him to HEAL Africa because of their policy of not turning people away! Last night a car with 6 occupants rolled over in Goma. A 27-year old died with an open brain injury and 5 others have been admitted with varying injuries, mostly orthopaedic in nature including a nasty fracture dislocation of the hip. Overall a fairly distressing week. It is all too evident after a death as all the family congregate near the death place (a cultural norm) and stand around talking like at a ‘wake’ and so there are many people around the Emergency Department this morning. This week 3 women have undergone surgery to re-implant their ureter (tube between kidney and bladder) after they were damaged by poor surgical technique during a Caesarean section in 3 separate peripheral villages. One had undergone 5 previous operations before being referred to HEAL Africa Hospital. There is so much need for surgery training, even just an understanding of basic anatomy. 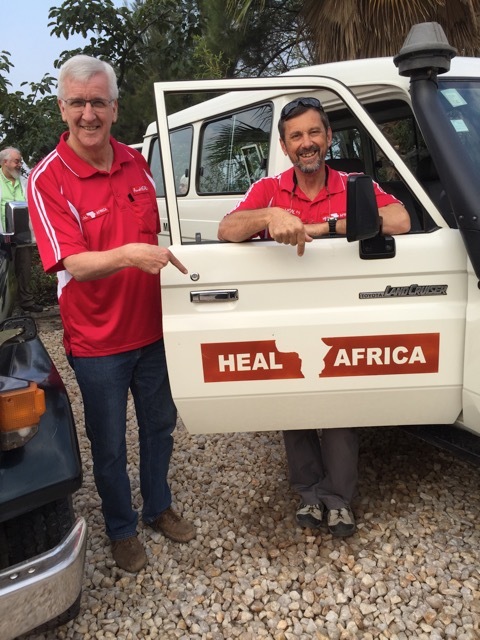 Darryl Burstow (Cardiologist) and Graham Zerk (Emergency Department Physician) left this week after their second successful AusHEAL team trip to HAH. It has been great to see them in action. 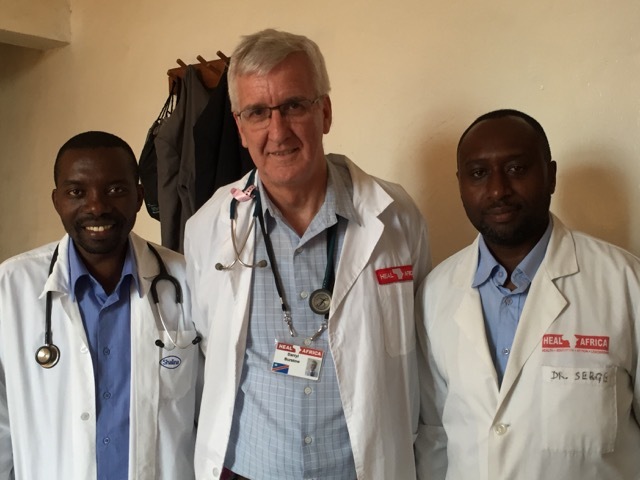 Although in Brisbane Darryl is an expert in ECHO cardiology and transoesophageal ECHO with all the usual array of expensive equipment the modern cardiologist uses, he has really tried to work out what the critical Internal Medicine issues are that can be addressed in DRCongo in a cost effective manner as we seek to create sustainable change and bring the most effective investment for the minimal funds expended. As he kept saying ‘what gives the best bang for the buck’. Equally Graham has been training the ED – Emergency Department – staff to use what they have to provide emergency care and not expect the latest equipment. He has made great advances in that area and his experience of 6 years in PNG has been invaluable. We had an excellent ‘exit meeting’ with the senior staff and the AusHEAL team before Darryl and Graham left for home in Australia. On the background of the AusHEAL workshop on ‘Being Organised’ Neil Wetzig sat in on a meeting of the HAH surgical staff (surgeons, ward and theatre staff) as they struggled to make the surgical service more efficient with few resources and little funds, to provide patient care. As it was explained this week, medical issues in Congo have changed little and the needs are still huge. International funding has been diverted to other world crisis areas such as Syria and South Sudan with funding bodies are deserting D.R.Congo. 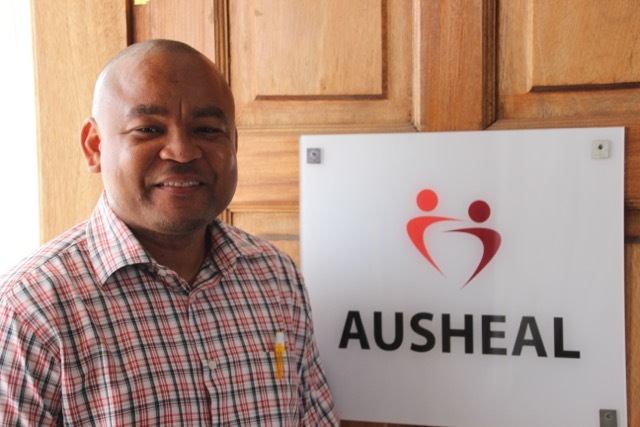 AusHEAL’s support from relational, training and financial aspects is therefore so critical in a country that remains the 186th of 187 countries assessed by the UN Human Development Index. Dr Ryan Williams has made great advances this week into training the HAH resident doctors, interns and medical students. Teaching in basic medical history taking and basic clinical examination is so needed in a system where this is not taught during 7 years of their medical course. Few patients are seen during that time. Ryan has been able to ‘get beside’ a number of staff and students and understand their issues. He will now hold twice-weekly meetings with them (sanctioned by the hospital senior staff) to deal with some of the basic issues of clinical assessment and care. Gwen Wetzig meanwhile continues to provide superb care and support for the team while fending off many requests from poor people for financial and other assistance. This is not to mention her work with HAH financial and administrative staff as well as her use of taking minutes in meetings. One of the hospital senior staff has conferred on Gwen an ‘honorary degree in Minutology’ which obviously does not exist but she was quite amused by his thought. Enough for this week as our numbers of the AusHEAL team in Goma slowly dwindle and in a few weeks only Neil and Gwen will remain in Goma.